Our A.I.-based reporting system has the capability of synthesizing the results of all the individual tests conducted on a sample into one report providing separate diagnostics both on the condition of the oil and of the corresponding equipment. 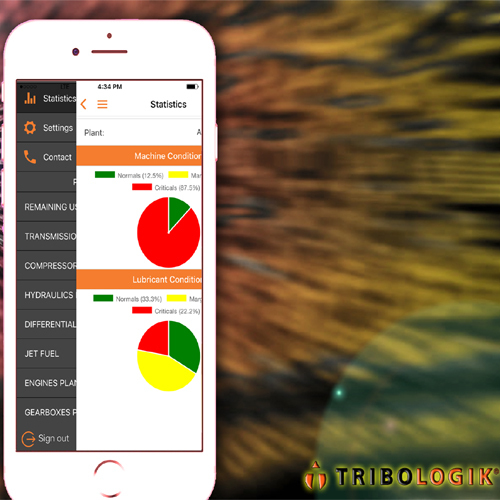 Based on these diagnostics, the Tribologik® AI report will generate maintenance recommendations and disclose the logic behind these recommendations.In addition to raw and graphical data, historical results of the previous analyses indicate trends in order to predict the maintenance that your equipment will need through a regular scheduled oil analysis program. Tribologik® oil analysis reports are easy to understand and can be generated in a majority of formats requested by industrial and professional maintenance organisations, including CSI, ENTEK, XML, etc. The reliability of Tribologik® oil analysis reports is assured by its unique dual AI controlled quality assurance system in addition to and in conjunction with timed calibration. Each laboratory instrument is linked to the Tribologik® automated Quality Assurance (QA) system that indicates the slightest abnormality in the testing procedure or instrument. The Standard Quality System (SQS) is a real-time alarm system designed to monitor the accuracy of the input data between calibrations. For each batch of samples the SQS analyzes randomly certified standard oil samples of known composition, at the beginning, somewhere in the middle and at the end of the batch. If the results deviate beyond standard deviations, the instrument will be recalibrated and all samples tested between this and the previous standard will be tested again. An audible alarm notifies that the instrument’s calibration must be verified. The Duplicate Quality System (DQS) randomly repeats certain tests to attest result consistency, precision and repeatability. The DQS randomly selects oil samples for a second analysis, then automatically compares the results of the two analyses using the DQS computer program. If the difference exceeds the normal range of statistical standards, an audible alarm notifies the lab technician and the instrument’s calibration is verified and all the tests performed in the interval are repeated. This duplication of testing occurs throughout the day. The Tribologik® dual quality control system is ISO 17025:2017 approved. As an ISO 17025:2017 cerfified laboratory, the Tribologik® system must maintain a high quality assurance, archiving and traceability level. Tribologik® archives all the SQS and DQS control tests performed daily and can assess the quality of any test throughout the testing history of all its customers. Graphs on the performance of any test are available upon request.